All. week. long. we as fans heard the chirping, the upset alert talk and bouquets thrown South Carolina's way. Many in the media had convinced themselves that this 2018 version of the Georgia Bulldogs was simply an imposter of last year's national champion runners up. Kirby and his crew had different ideas and within the first four minutes at Williams-Brice Stadium imposed their will on the Gamecocks and their EDM-loving (that's electronic dance music for you older folks out there) crowd. And, the in stadium director just kept on playing Sandstorm even after much of the Gamecock faithful had headed towards their parking lots (and yes, Columbia is just that - all parking lots). This is episode 146 of the Waitin' Since Last Saturday Podcast. It's our postgame show and Will, Tony and I got together via Skype late Sunday evening to discuss what we all saw. You'll hear Tony start us off quoting D'Andre Baker's amazing postgame soundbite which had the internet rolling in laughter. Will provides his first half analysis. Why just a first half analysis? It's because he was at a wedding in Missouri and his sister is not a Georgia fan. Oh well, it's still solid analysis. As for me, I scribbled down some stats about the game and offered up my fair share of thoughts. I will say, it was a bit tough for me during the game because I was watching it along with 9 children, but I digress. 83,140 was the announced attendance. The 24th largest crowd to watch a game at Williams-Brice Stadium. Yeah, I was surprised to see that they even bothered with the 24th largest bit too. 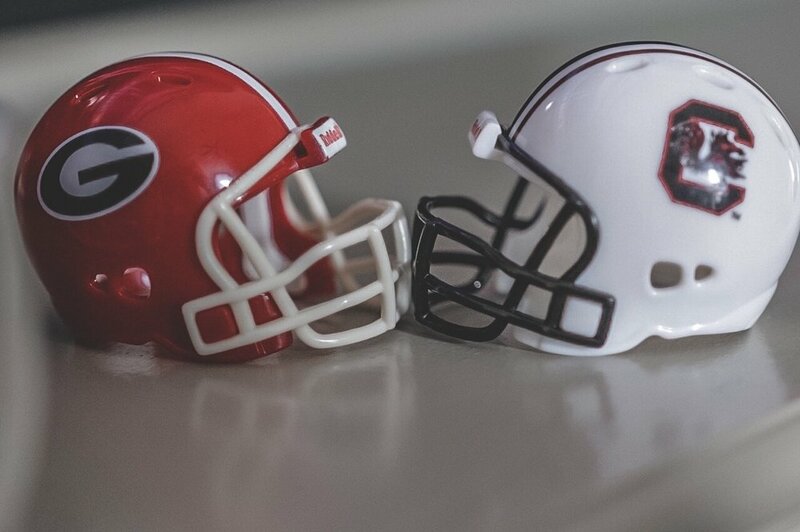 South Carolina suffered their worst home loss to Georgia since 1971 when the Dawgs beat them 24-0. The 41 points scored by Georgia was the most points scored in Columbia since '94 (that's 1894)! A streak that seems likely to be built upon is growing larger. This was Georgia's 4th win in a row over South Carolina. If you're interested in purchasing one of our Waitin' Since Last Saturday T-shirts, click the link to buy. Once their gone, they're gone. Also, we love the reviews we get via iTunes. If you're an Apple iOS user and consume our shows that way, leave us a comment or write a story. We'd love to share it on a future episode.